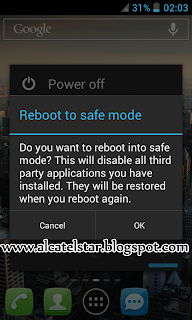 In this post I will describe how to boot into Safe Mode on Android device Alcatel STAR, IDOL, XPOP, MPOP and others and actually for what it's used. Мany Windows users know Safe Mode is a place where you can uninstall, install, remove something like Repair center. 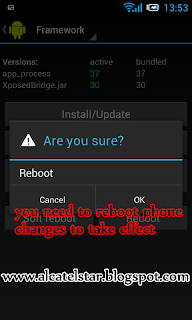 So on Android Safe Mode is the same if your phone makes the problem of the nature of force close you need to perform this action.On Safe Mode all third pary apps are disabled and you can uninstall if you think there is a problem on some apps that you installed earlier.After rebooting in normal mode all apps will be restored at normal state. 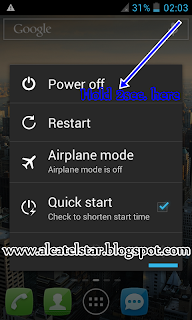 To boot into Safe Mode you need to Hold Power off button on power menu like on screen shot. Will be appear new window with message "Do you want to reboot into Safe Mode ? and you need to confirm to reboot into Safe Mode. When phone booted into Safe Mode at bottom right cornel will display the caption "Safe Mode" this means that you are Safe Mode then I hope you know what you are doing. What's excatly Xposed Framework ? It's App that modify your Android User Interface like statusbar tweaks, display tweaks, navigation bar tweaks, phone tweaks, media tweaks, power tweaks, hardware keys tweaks, advanced power menu(I mean reboot to recovery, shutdown, reboot) changing icons, changing colors of statusbar, transparent notification bar, turning capacitive buttons for notifications and many many more awesome modifications & tweaks. 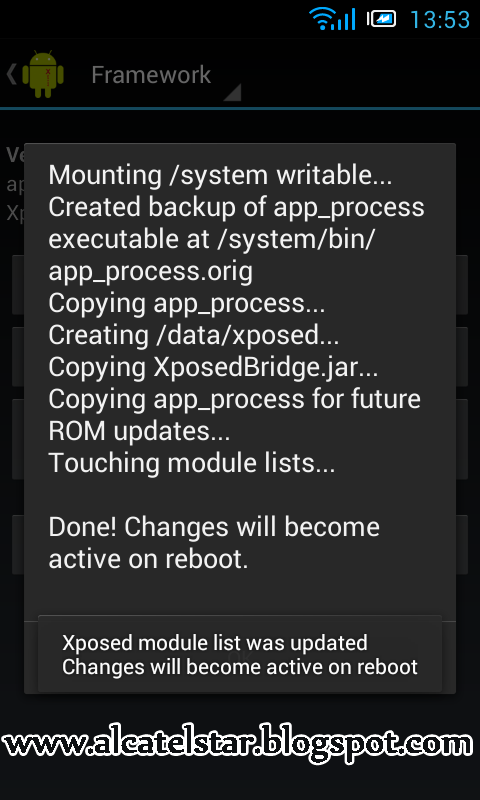 Xposed Framework app borrows with Xposed Modules. Framework is heart of operation but Modules is the other major part of the operation.Also Xposed Framework can not operate without Modules and vice versa. Each Module have different features that developed by different person. 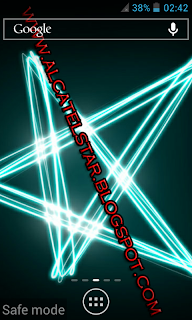 Disclaimer: We(alcatelstar.blogspot.com) or developer of this APP are not responsible for any damage on your phone after installation this APP. I recommend for some reason, please make a full Nandroid backup of your whole system.I think no high risk of hard bricking only soft bricking like bootloop. 1. So when you have already on your phone latest Xposed Framework. 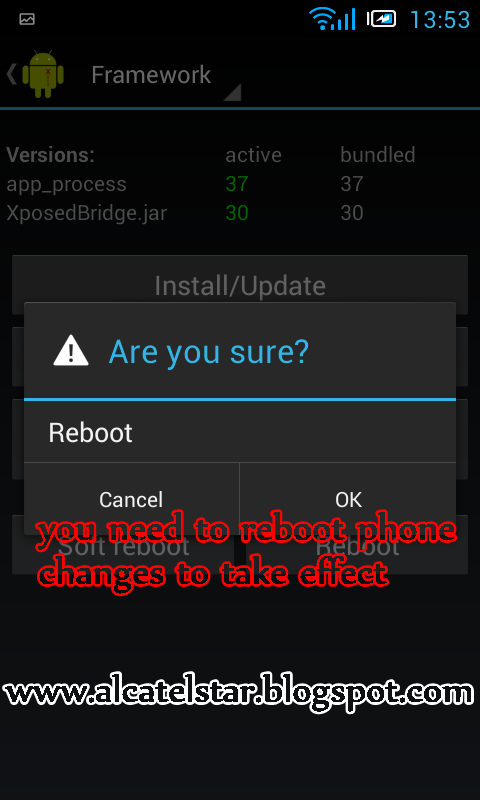 4.As you can see on screen shot you need to reboot your phone to working Xposed Framework. 5. 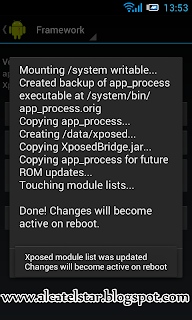 After rebooting launch Xposed Framework and go to Modules and you can install any Modules but not all are compatible and working. 6. I tried all Modules but for my Alcatel STAR 6010x only works GravityBox, Xblast Tools and some smalls like Advanced power menu. But GravityBox have a set of amazing features that will work on most Android phones your phone. 7. Here's the GravityBox Module download from button & install. 8. After installation of Module you need and this to activate you will see notification with warning for activation. note: don't forget to reboot phone after playing with Module to take effect. 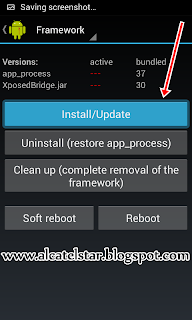 note: If you don't like this app you can easily uninstall as you go to Xposed Framework app and go to first option Framework then "Clean up".